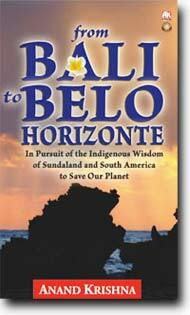 Official Site for the Book "from Bali to Belo Horizonte"
Join me, friends, as we undertake a sage’s journey. Our trip will not be a scientist’s travelogue, but a sage’s sojourn through two cultures: the culture of a Sindhu Valley Civilization, represented by Bali in what was once referred to as the lesser Sundas, and the culture of the Ancient Amazonians, represented by Belo Horizonte in Brazil. On the surface, the two places look completely different. Bali is Bali. And, Belo Horizonte is Belo Horizonte. But, on a more basic level they are one and the same: Bali is Belo Horizonte and Belo Horizonte is also Bali. Bali is often referred to as Beautiful Bali. So, too, “Belo” in Belo Horizonte also means “beautiful”. Beautiful is English for belo, and belo is Portuguese for “beautiful.” In the Indonesian language, “belia” also means beautiful. Belia, belo, beautiful and beauty are universal. Thus is it so in Balinese, Indonesian, Portuguese or Brazilian. Horizonte is “horizon.” If beauty is universal, then also our horizons are limitless, infinite. It is vast, as vast as the skies and the seas. Horizon is both, nature and natural. And, nature knows no boundaries. Boundaries are never natural. Freedom is natural. Humans create boundaries and impose limitation on freedom. We have distanced ourselves from nature and from Mother Nature, by creating such boundaries and limitations. The extensive essay appearing in the second part of this book was prepared for a conference in Belo Horizonte and presents an attempt to rediscover the universal beauty found in the culture of Bali. Bali is located in the Lesser Sundas of Indonesia – or “Nusantara” - the name by which the archipelago has been known for thousands of years identifying it is an integral part of the great Sindhu Valley Civilization. Meanwhile the culture of Belo Horizonte, Brazil, Amazon, Americas forms a part of the equally great Mayan Civilization.